SAN JOSE, Calif., Oct. 08, 2018 (GLOBE NEWSWIRE): Broadcom Inc. (NASDAQ: AVGO) today announced its latest portfolio of automotive Ethernet devices designed to advance in-vehicle connectivity, infotainment, advanced driver assistance systems (ADAS) and smart mobility. With more than 50 million automotive 100BASE-T1 BroadR-Reach® PHY and switch Ethernet ports shipped and growing, Broadcom expands its portfolio with the addition of 1000BASE-T1 PHY, secure switch and smart camera MCU devices to address new and emerging applications. Ethernet has become the de-facto networking technology for connecting various electronic systems in the car, such as body electronics, infotainment, and ADAS. High speed Ethernet links are essential in getting endpoints such as cameras, RADAR and LIDAR to transfer large amounts of data across the network for accurate real time decision making. Broadcom’s latest addition of 1000BASE-T1 PHY and secure switches address this need for higher bandwidth while providing an unprecedented level of performance, efficiency and scalability. The BCM8988x (1000Base-T1 PHY) and BCM8955x (Secure Switch) are designed to operate over one pair UTP cables which are important for reducing weight, space and system cost. These products also deliver best-in-class EMC and EMI performance and support PoDL functionality for automotive applications. The BCM8910x (Camera MCU) devices with fully integrated image processing and Ethernet streaming pipeline allow for scalable camera solutions from low latency video encoders to smart camera MCUs, addressing a wide range of automotive vision-based applications. Broadcom will showcase its latest portfolio of automotive Ethernet devices and discuss next generation technologies at the 2018 IEEE-SA Ethernet & IP @ Automotive Technology Day in London, UK from October 9th to 10th . 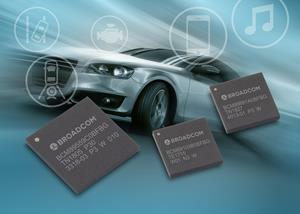 Broadcom is sampling the BCM8988x, BCM8955x and BCM8910x to selected automotive OEMs and Tier 1 suppliers. Please contact your local Broadcom sales representative for samples and pricing.